Don’t forget to send your competition scores our Club Records Officer! Use our submission form available here. More national records for Sam B? 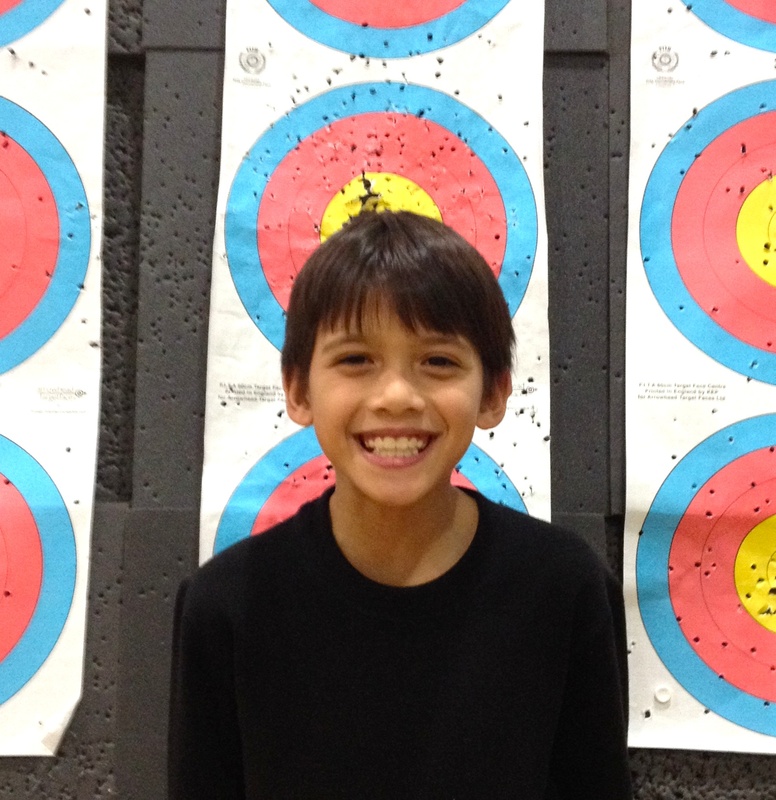 RTAC’s superstar barebow (and now nascent recurve) archer Sam B has been busy closing up his 2015 outdoor season with a bag of potential national record claims – adding to his already impressive collection of certificates! 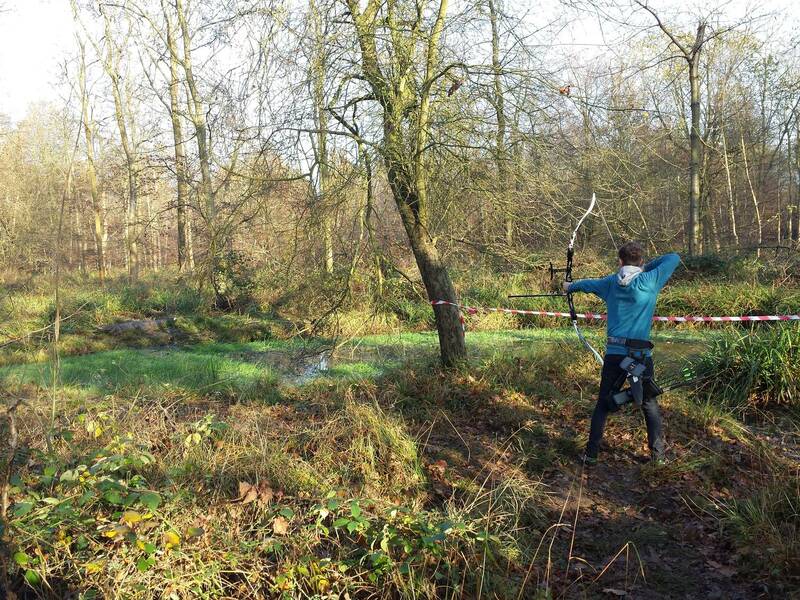 Beautiful setting (…at the Hampshire Championships), plenty of archers on 29 targets shooting Metric rounds. Carla Piper was our welcoming host, arranging a target just for Samuel, and a handful of jovial judges who made our day most enjoyable. Samuel claimed 3 National records, 40m with 260 points (though this may have been recently beaten but not yet updated), 30m with 297 points (breaking his own record) and finally the Metric iv record (which has stood since 1990 at 1149 points) with 1171 points. All in all a decent final shoot of the outdoor season. Once again, our congratulations to young Sam (and his support team) for such outstanding results! Shooting at Deanes resumes next Monday (7th September). There will be 2 sessions @ 4.30p.m. & 5.30p.m. For the time being, there will be NO further organised shooting (i.e with coaches in attendance) on the field @ Runwell on Monday or Tuesday evenings. Results for this year’s club FITA/WA shoot are now available! Well done to all archers for some great shooting, and particularly Ryan H who beat his own club record! We are AWESOME – Noak Hill conquered! On Saturday 6th June, a rowdy band of Red Ants travelled west to Noak Hill for the annual Essex County Junior Championships, contesting the various Bristol rounds in both recurve and compound categories and practically filling the line with our new shirts! Full results to follow soon, but as evidenced by the trophy in the photo, we brought home the bling! 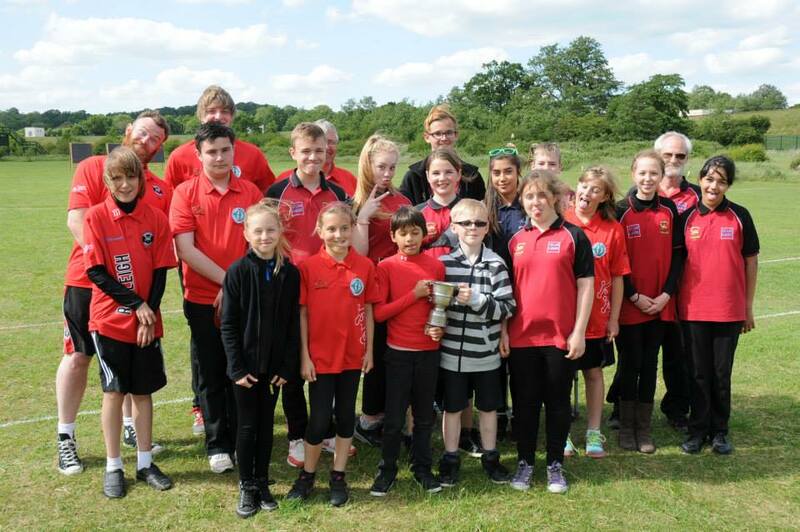 Everyone was impressed by our achievements, turnout and demeanour – well done to all the Juniors, parents and coaches for a great day of archery. On Sunday 7th, the seniors pitched up to contest their own annual championships. Paul and Tim took to the line in the gent’s recurve York, Chris Clayton in compound York, Marie M in ladies bare bow Western (the only entrant!) and Carmella – our Visually Impaired (VI) champion – in the ladies recurve. Again, full results will follow but as with the juniors the day before, we acquitted ourselves admirably: Paul hammered home Bronze medal in the Gent’s Recurve, Marie won her category and Carmella also medalled (* sorry, can’t recall the result but will fix when they are released!). All in all a fantastic weekend of fair weather (if a little blowy up there on the hill) and wonderful results for the club! On a cold, sleety February morning nothing warms the toes more than some serious competition amongst good friends – except maybe underfloor heating…! So it was that a few of the RTAC massive ventured Braintree-ward to take part in their 2015 Worcester shoot. 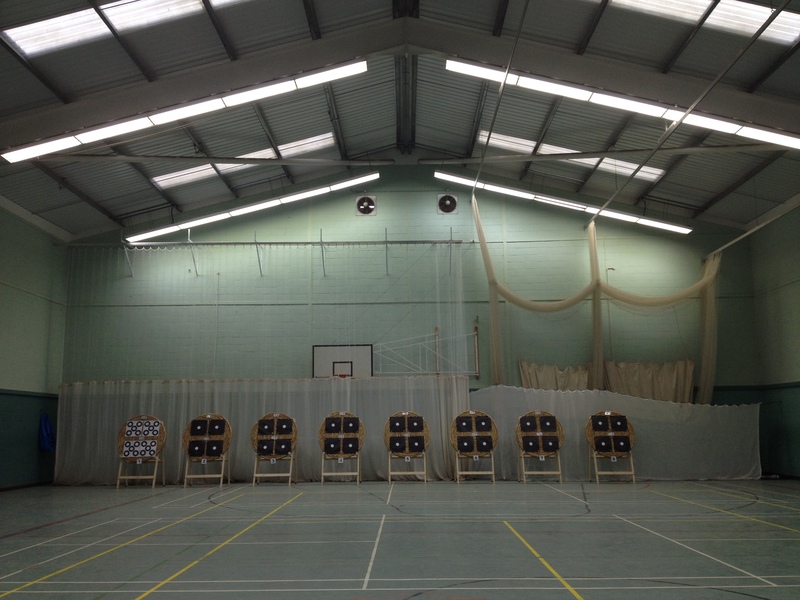 As always, the Bowmen made everyone very welcome with warm smiles and limitless free tea and biscuits – their new ‘home’, the light, bright sports hall of a large school was fantastic: evenly lit and spacious, archers had plenty of room to spread out and relax. Three sessions today: Tim shooting all three to be joined later by Phil R, Paul W, Lauren B and, on her debut appearance in club colours, Lilly in Session B and finally, in Session C by two more juniors Joshua and Mia, along with the Birdsall Boys: young Sam and dad Zep. Quite a team! Tim shot well enough in the first session to claim 1st place – holding it together for a very welcome cup of tea and bourbon biscuit at the end. The session had passed quickly – plenty of time to relax before Session B: some good chat with super-organiser Paul Ramos and his working party while the next contingent of shooters slowly gathered. Paul, Phil, Lauren and Lilly took up position as Session B began. Although Tim was tiring, Lilly soon got the hang of this most esoteric of indoor rounds – a couple of misses aside she shot very well indeed – and more importantly thoroughly enjoyed herself! Lauren was a little disappointed with her final score, but Paul was always going to hit his PB! and Phil also shot well after making serious changes to form. Our host Paul Ramos was trialling his brand new toy: a lovely silver Hoy Prodigy setup which, despite being only a couple of days old helped him secure 1st place for gents recurve in this session – well done lad! Team RTAC also won medals in this session: Lauren taking gold for Ladies U16, Mia taking gold and Lilly, on her debut don’t forget, taking home a bronze medal! Wonderful stuff. There was more to come in the last Session: Josh arrived with his dad, as did Sam who both shot superb scores (Josh, again, in his debut competition). Phil and Paul carried on along with Tim (very tired now!) and Zep who suffered a little but still enjoyed the day. In the end, RTAC made a huge impression on the scoresheet: loads of golds for both session and overall, a clutch of silvers including Team Medal and a bunch of bronzes. Well done to everyone for making the trip and performing so well. It was, as always, a fantastic event – brilliantly organised by Paul and his crew. I think we’re already looking forwards to next years! PS: we’ve got to start getting photos of the team at these events! 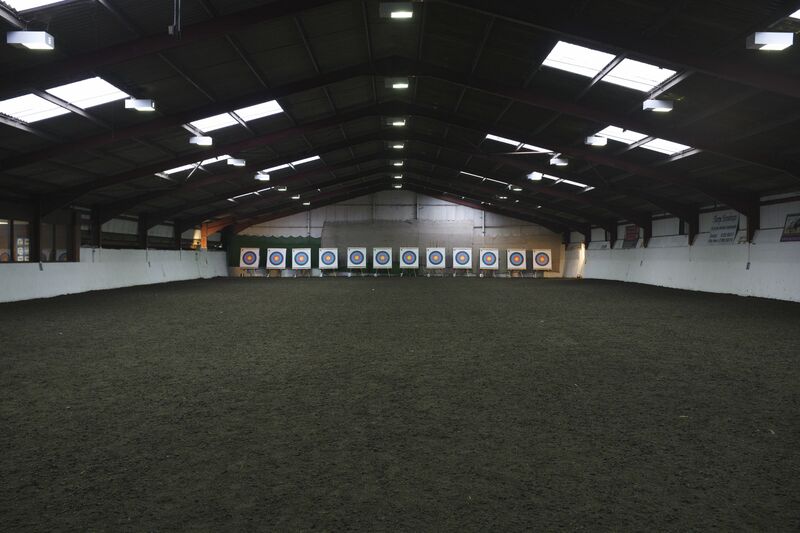 A few RTAC archers enjoyed an ace afternoon at Raydon Hall’s Indoor American shoot, brilliantly organised by Richard Pilkington and his team at the Wix Equestrian Center. Shooting at 60, 50 and 40yds on 122cm target faces, we had to be careful with sightmarks: not only was the ceiling a potential hazard for the lower poundages, behind the backstops nets were a couple of 8x4ft mirrors just waiting for errant arrows to miss the targets, get through the nets and a protective panel of wood. Indeed, one compounder managed to get the point of one of his arrows within a hairs breadth of them…! The arena was COLD! It was truly warmer outside than in, and the small adjoining cafe a welcome respite with its lovely food and hot tea. Chris Clayton and Tim were supposed to be shooting in the morning but car trouble prevented Tim from making the early start. Chris, however, managed to bag a third-place medal (despite shooting ‘too many sevens!’). With fresh wheels, Tim was there for the afternoon, along with the Rowberry Boys Alex and Phil. Alex was shooting above his age group at the 60yd max distance and ended with a total score of 583 with dad Phil battling a cold to score a great 649 (especially after making some major form changes only yesterday)! Men’s recurve was won by (who other?) Michael Judd with an awesome 802 out of max 810! Congrats also to our pal Paul Ramos with his third place behind another AGB international Brad Denning. All in all a great shoot: highly recommended for next year – although I might be wearing at least one extra layer! Donning warm and wet weather gear the brave hearts began the 3 dozen arrow at 30m shoot at 11.00. Among the 10 was only one junior, Lyndsey Hall. Full marks to her as she had not shot this far before. Club Records Officer Andy R has pulled together all the scores from 2014 so far and compiled a new set of Club Records! Find the list and details over on the Club Records page. Joshua B, Charlie D and Alex R, too, bested a bunch of indoor and outdoor rounds! In the Gents U16 category, Jason T‘s name appears against all the records! Well done Jason! Great to see Grace T claiming Bristol IV, and Helena M beside both the Junior Western and WA18 Triple records. Lenni C also claims a load of records in Ladies U18 compound after a very successful outdoor season. Of the adults, Iain M dusted off his longbow to claim a new scalp in the Short Warwick back in April, and stuck with his recurve to take the Long Metric I later in June! Phil R got his name beside the Metric I while Jackie H topped the National, Hereford, Albion, WA1440 and Western – wow! So all in all a fabulous year for record-breaking. Well done to everyone on the list – I wonder how long those records will stand? 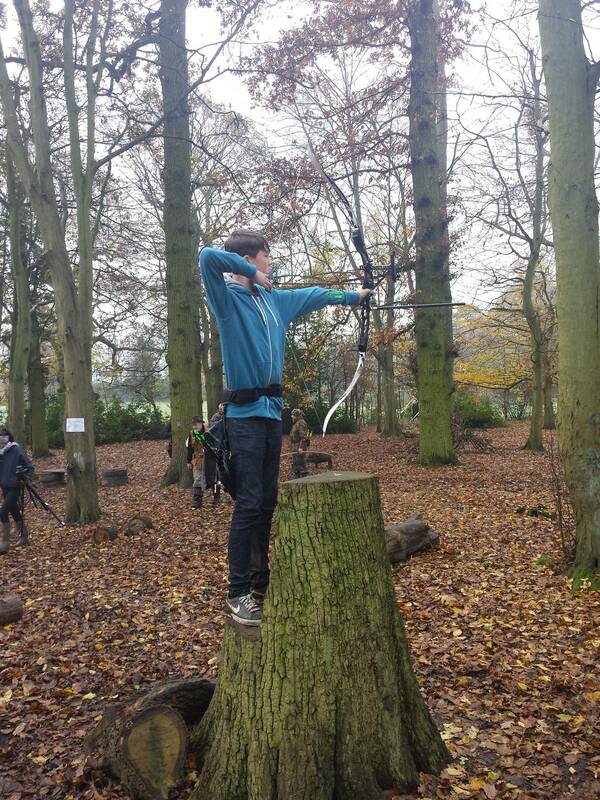 RTAC member Josh B recently ventured to the wilds of Galleywood and Braintree to try out a bit of Field and 3D archery. 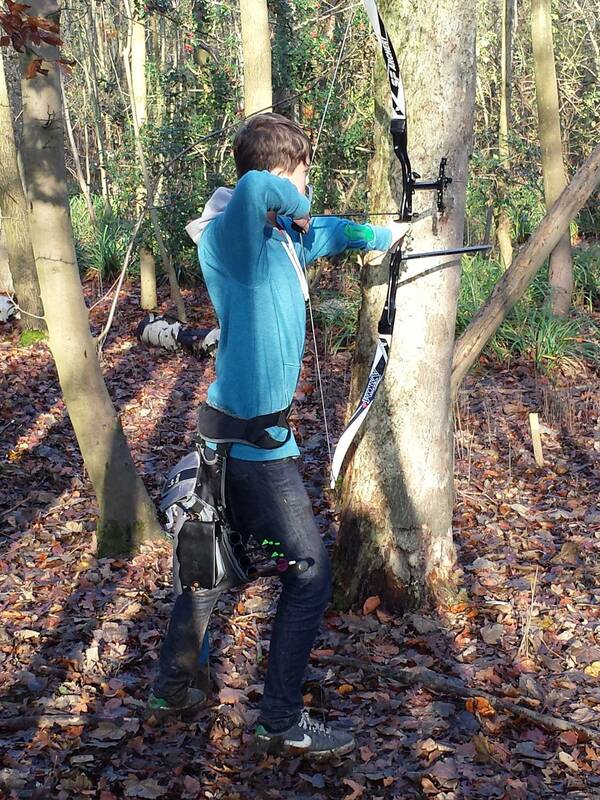 Josh first took part in Panther Bowhunters’ Record Status FITA24 in October, and although didn’t place in the results thoroughly enjoyed the days shoot in the woods. 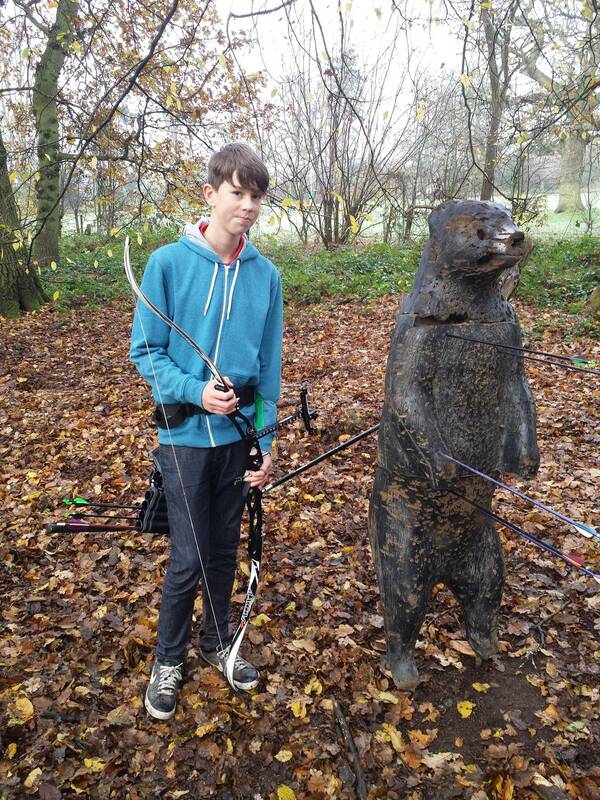 Braintree Bowmen’s 3D Animal Shoot was next – 22 targets in and around the woods but this time the targets were models animals rather than paper targets…the day was spent shooting deer, boars, turkeys, rabbits, a lion, an alligator, lynx, an owl perched in a tree and a large bear. Just to add to the interest, all the distances were un-marked, leading us to try and guess sightmarks. Despite the chilly start and the muddy conditions it was an excellent day, topped off by Josh getting silver in the under 16 section. We would recommend all members trying a field shoot, especially a 3D one. Each target is different and having to stand on logs or lean around trees certainly adds some spice to each shot. Well done Josh – looks like they were cracking shoots! RTAC has some very keen Field/3D shooters – some venturing onto the continent to shoot those extreme angles and environments! Get in touch with the coaching team if you fancy trying it out!